The Swans of Wells auction, held in a giant marquee in the grounds of the Bishop's Palace, was a enormous success, with over £110,000 worth of bids made for the fabulous flock, which will result in an excellent amount to be donated to local charities. 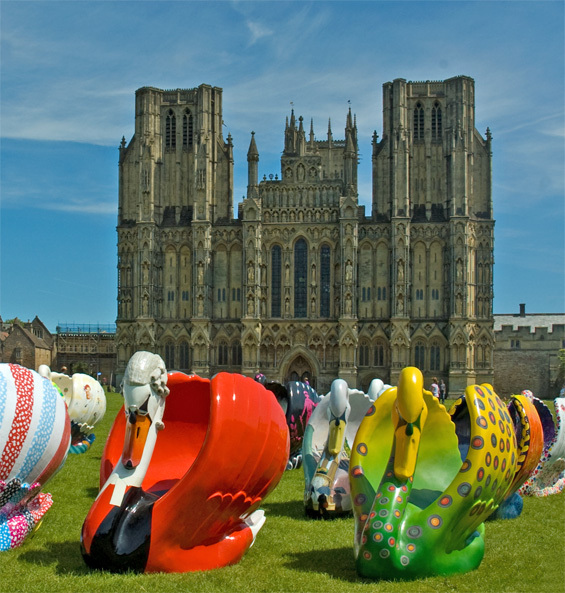 In the summer of 2012, the city of Wells in Somerset became home to a giant flock of sixty magnificent swan sculptures, displayed in a stunning sculpture trail across Wells and the surrounding Somerset area to celebrate England's smallest city and commemorate the Queen's Diamond Jubilee. A range of Swans of Wells merchandise is still available, ie posters featuring all 60 swans, t-shirts, mugs, the official book of the project and other souvenirs. Please email danny@swansofwells.com to place your order. The fabulous swan sculptures were displayed on the streets of Wells for three months over the summer and were then gathered in one giant flock om the grounds of the 800 year old The Bishop's Palace in Wells for the Swansong Auction Preview weekend. The event was a huge success, attracting over 10,000 swan fans and received excellent media coverage from BBC news and radio, the Press Association, Western Daily Press, Wells Journal and websites, with photos and news of the event published across the UK and overseas. The Swansong auction was held at the Bishop's Palace on Saturday 29th September and was broadcast live on www.i-bidder.com allowing swan fans around the world to tune in and bid for their favourite swan. The highest price fetched for a swan was £9,000, which was bought by a consortium of Wells residents to ensure the popular Guinevere remained floating on the Bishop's Palace moat for many years to come! We hope you enjoyed swanning around Wells over the summer and many thanks to all swan fans and the residents of Wells for sharing their beautiful city with the colourful and stylish flock. SWAN SOUVENIRS - A range of souvenirs is now available from danny@swansofwells.com or to buy online via www.myhigh.st (scroll down the shops on the left and then click on Swans of Wells). Happy shopping! For more information about swan souvenirs, please see the Shop Page of the website. FUTURE EVENTS - The Swans of Wells event was inspired by the Lions of Bath 2010 and both of these popular public art projects were organised by Witty Events & Marketing, which was also responsible for the King Bladud's Pigs 2008 charity auction, which raised over £200,000 for charity. If your town, city or business may be interested in a similar venture, please contact megan@wittyassociates.co.uk or phone 07720 880088 for further details.